It is said that Balenciaga (couturier and designer) enjoyed traveling by train inspired by what he saw from the window, to generate ideas for new forms, silhouettes and creations. Pumpkins in the field inspired his balloon skirt, a canvas tent his tent dress, sunbeam pleated skirts from the rays of the sun. Inspiration came to me for the sculptural figure you will see displayed at the bottom of the stairway entrance to the School. 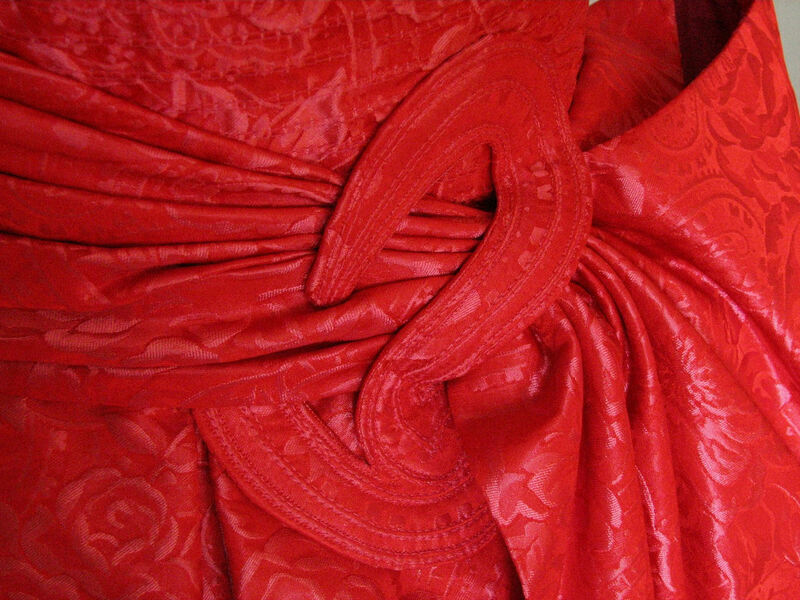 One first recognizes its form or shape, then its structure and then the design of the fabric draped around it. These three elements are the basis of what Ecole Holt Couture teaches: form, structure and design. As with any new language one must first learn to recognize its alphabet, in music for instance. Before writing music, not least a complex symphony, one must first learn to recognize the notes and their position on the staff lines, time signatures, and get a feel for rhythm. To perform music from written score, one must first learn how to play the instrument. And before any instrument can be played, it must indeed, first be created. Before anyone can create couture, they must learn the basic stitches and their applications, details and combinations of details. Then how to use the tools, and also how to make certain tools. That is what the EHC Sampler resource library is for, so that each student can first learn professional couture sewing basics. In the process, students build their own personal resource library for future reference. In Terms one and two, the 9 projects required must be wearable unlined garments of pure cotton and pure linen fibers, each project introduces increasing complexity. In Term three, students are already creating a four piece business suit including a blazer, skirt, trousers and vest, each fully lined. The suit must be made of 100% pure wool and natural fiber linings and interlinings. Term 4, 5 and 6, the projects in the second year are all made of 100% pure wool, silk fabrics and including high quality lace. All these projects are fully lined and structured. Each project throughout the curriculum has been carefully selected as a classic garment with an identifiable origin. Students learn to recognize style from trend, and understand how styles cycle and recycle through time. They learn how to build a client-specific (which is not the same as a ‘targeted market’) wardrobe, and design a collection that is appropriate to a specific individual, thereby applying their own creativity. In year three, Terms 7, 8 and 9, students learn the skills of hand knitting, and how to work with pliable leather. They learn how to tailor both ladies and men’s garments in the haute couture and bespoke methods traditional to each profession. The techniques for mens’ and ladies tailoring are not the same. In the fourth year and final three Terms, students create a formal tailored tuxedo outfitting either a man or lady, complete with cummerbund, bow tie and tuxedo shirt. They learn how to work with fur, handle velvet, how to embroider, create cutwork and hollow work, bead work, and smocking techniques. Students create accessory items such as hats, and detachable collars. They practice different methods of pattern making to flat pattern drafting in the previous years, such as body draping and transformational pattern making. At the end of four years, the graduating student must create a fully structured Ball gown or Wedding gown as their ‘master piece’ without the help from an instructor. When successfully completed, graduates are entitled to refer to themselves as professional couturiers and tailors with the skills to begin their career journey. Formally trained couturiers and tailors are artisans as well as craftsmen who continue to experiment and gain experience throughout their careers, each year becoming more proficient and more highly sought after. Ecole Holt Couture School of Sewing and Design is where students come to learn on a full-time basis earning an EHC Dressmaking Certificate and EHC Couturier/Tailor Diploma. Each student must maintain an 80% minimum grade level assessed every 10 weeks to continue on into the next term. There are three terms each school year. Each Program is two years in duration, totaling 12 terms or four years. Only successful graduates holding an EHC Certificate Dressmaking Award may enroll in the EHC Diploma program, having acquired the required skills to enter the Couturier/Tailor program. At the beginning of each class day we assemble for a short meeting, after which the day is spent covering EHC course material relevant to the schedule. Rather than assigning reading material as homework, we engage the entire class (of six people maximum) so that questions that come up can be addressed immediately for everyone’s benefit. This normally consumes about 20 to 25 percent of the class day. The remaining 75 percent of the day is entirely supervised hands-on work. Every project initially begins as a working sketch drawn by hand within imaginary box outlines, according to a ‘client’s’ proportions, and later progress to freehand drawn realistic illustrations with student designed garments in contextual backgrounds, and finally to fashion magazine type figures with more artistic expression. EHC’s goal is to train the mind, hands and eyes to work in harmonic synergy producing a finished product. Taking appropriate measurements, documenting them, and then applying those measurements creating an original pattern according to the design. First fittings on the client are performed with a ‘toile’ created from that pattern. Then the actual garment is prepared from the toile. More fittings and continuous structuring, with a 50/50% ratio of sewing/pressing. One secret of success to professional results lies in pressing at the right time using the right methods. The entire couture process is 80% hand worked, sometimes more and sometimes a bit less.The final product must be as finished and as beautiful, on the inside, and in between the layers as on the outside.Couturier and tailoring students bring their designs to reality. In professional practice, before the final owner of the garment takes possession of it, they must try it on one more time to make final inspection of themselves in the mirror. Only then can it be allowed to leave the couturier or tailors studio. It is the couturier’s ultimate level of gratification to see a client’s eyes light up. To hear them proclaim its true comfort and fit, beautiful finish and flattering style, is the true confirmation of success. Many do try to ‘copy’ original (haute) couture creations, but they cannot ever be truly duplicated. What struck me as a good comparison to this was inspired by a documentary shown on PBS TV about one Stradivari violin made in the 17th century and how truly unique it is. The “Stradivarius” has become associated with excellence; to be called “the Stradivari” of any field is to be deemed the finest there is. Looking deeper uncovered certain experts had analyzed the Stradivarius violin, along with one Guarneri violin also made in the 17th century. From the outside they both looked so similar, almost identical. Each one was of the highest quality and wonderfully crafted, but each had very distinct sounds. But what made them so distinctly different? The wood used to make both violins had a very particular quality and density.The Stradivarius was crafted to perfection on the outside, inside, in every groove and chiseled stroke. The varnish recipe used for the finish, also believed to be part of the reason for its unique sound died with the maker at the end of his 70 year career, and is still a mystery to this day. The other violin was also crafted to perfection on the outside, but the inside – was left in a somewhat less state of perfection. Expert comments suggested that the Guarneri violin was somewhat easier to play, more forgiving, and had a larger range of tone. But it didn’t have the fineness of tune of the Stradivarius. The Stradivarius was more difficult to play requiring a very precise touch of the bow. It is said to be very unforgiving, so that only the most accomplished violinists can bring life to it producing such an exquisite sound that has never yet been replicated. 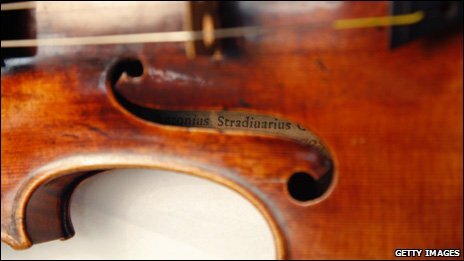 The Stradivarius is still being played today, 300 years later, sounding as excellent and as unique as was at its first debut. Expertly made, well fitted haute couture and bespoke tailored garment cannot be identically copied. The secrets lay within the mind, the soul and in the skilled hands of the creator, and is proven by the workmanship on the outside, inside and in between layers of every piece. Who is top couturier / tailor / designer today? Happy 10th Anniversary Ecole Holt Couture!